It is easy to forget how important food production is when most of us take for granted that the food we buy and eat has actually been subject to stringent safety checks. The process for a prepared food to reach us is even more onerous than simple fruits and vegetables. Many people are unaware that animal testing can play a major role in ensuring that the foods we consume are safe and hygienic, both in the short-term and the long-term. In fact, the use of animal testing for foods, food additives, nutritional supplements and sweeteners tripled from 2005 to 2006. The massive increase has led many people to ask just what price is required for human health. They also wonder if there are better ways to ensure that foods are safe - ones that do not require animal testing. The vast majority of food tests are performed on laboratory rodents but some are also performed on guinea pigs, dogs and rabbits. The tests may involve oral administration of a foodstuff or application to the skin or eyes. Some procedures can be painful for the animals and may involve the forced creation of damage or an injury to analyse and investigate the effects of food or various supplements. In addition to ensuring ready-made meals and nutritionally enhanced foodstuffs are safe and live up to their claims, animal testing is also used to develop vaccines and other preventative and treatment methods for livestock. This ensures that our meats are safe to consume and that any illness occurring in the livestock is less likely to spread, which could potentially create a shortage of the food if it reached epidemic proportions. This type of veterinary testing is vital and links up to the food production industry. The trend in recent years to eat healthier foods has led to a massive demand and surge in the marketplace for such products. Ironically, this has led to a similar increase in the number of laboratory animals used for testing of food products, which includes additives and various health formulations. Claims that a specific margarine can aid in cholesterol reduction or that a yogurt can help to improve digestion all require animal testing and then clinical trails to show the validity of the claims prior to their approval. 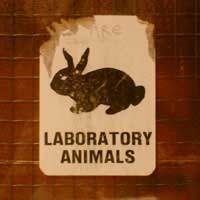 Some laboratory tests require that an animal be fed a particular substance and then killed, which allows researchers to dissect the animal and investigate where the substance is concentrated and how it affected organs. The recent increase in laboratory animals used for food tests has, as expected, led animal welfare groups to perform their own investigations and conclusions regarding this area of animal testing. Some groups have suggested that not all tests are necessary and for those that are, they cite that testing could easily occur on humans rather than animals. Those in support of the testing - mainly the government and scientific community - purport that the tests are all necessary to meet regulatory requirements. Some are asking if the increase is avoidable at all and if it will only continue on an upward trend. As more people become concerned with health and nutrition, the demand for easier improvement of health through nutritionally enhanced foods will likely continue, which unfortunately for animals means that their use will become more important than ever. In the meantime, it is hoped that the development of alternative methods for animal testing will also continue, which can ideally allow for more healthy foods to receive approval and less animal use in the process of food production testing. I’ve been searching the internet tryin to find what brands for food don’t test on animals, I’ve gotten no where, it’s all about healthcare products and what the experiments are about. No, I want to know what food brands do not experiment on animals so I can eat happily knowing an animal didn’t suffer for my consumption, can someone help me? Please stop the non-consensual animal testing. It is the Golden Rule, "Do unto others". Last I checked, non-human animals are also "others". If they are not others, then what are they? Objects? Things? Only dead "Its" can be things...while living, they are pain-capable Someones, not Somethings...Hes and Shes...not its...and thus can not be property. To convert someone into being dead against their will, when they wanted to live, is a sin, it is a crime of non-examination of our conscience. We are guests on this beautiful blue and green planet together and can not judge their intelligence by our lifestyles, by our lack of trying to understand them, by our denial of the sameness in our body language, or place a monetary value on their lives, as we all seek to give meaning to our own lives. What is your life worth to you, and what does it mean for you? Each individual has the right with peaceful freedoms to determine that for themselves.Our "rights" end where another nose begins. If someone does not give permission to be a test experiment and especially not a murder victim (which all non-human animals tested on are afterwards, as they are ALL simply murdered and thrown away afterwards, regardless of the outcome), then how do you dare call someone an extremist for standing up for them?! If you were being forced into a position like this, would you not want someone to stand up for and liberate you? Or would you say, "Oh, my death is going for "the greater good", so I am told. It must be alright then. Go ahead and kill me." Animal testing isn't right and is cruel. This is just wrong - if we all ate naturally grown seasonal foods it would do away with the need for testing.